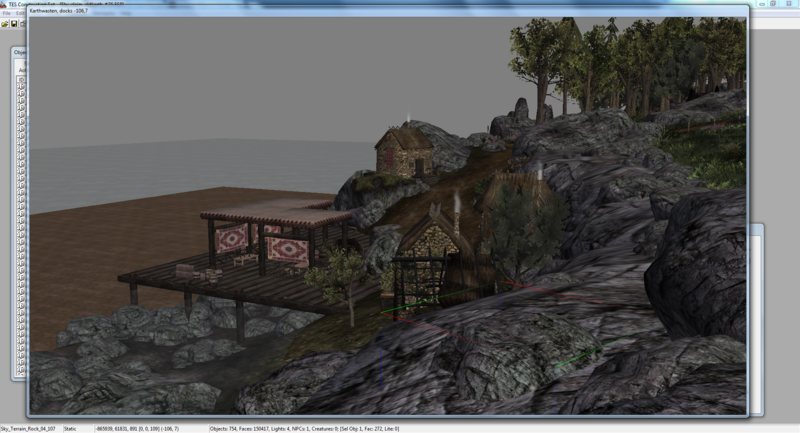 Please work with Yetis latest file of Karthwasten and Berrys finished exterior claim of the Druadach Highlands. 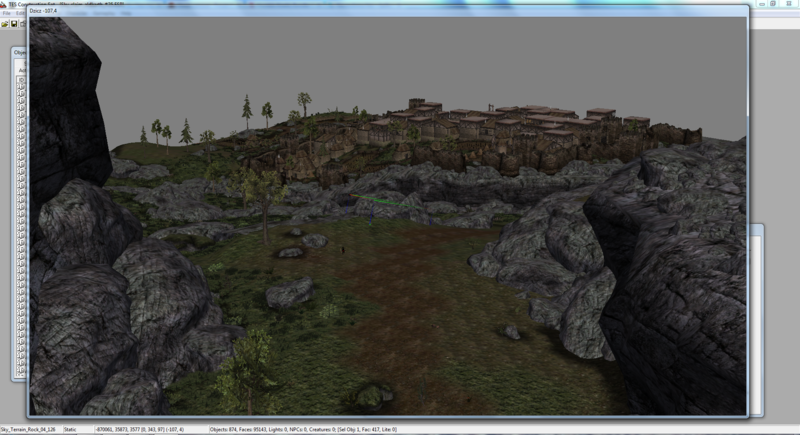 Might I grab the bridge cell from #19 too, from Skyrim_main file? It will be more effective to work on the passage area here as a whole. 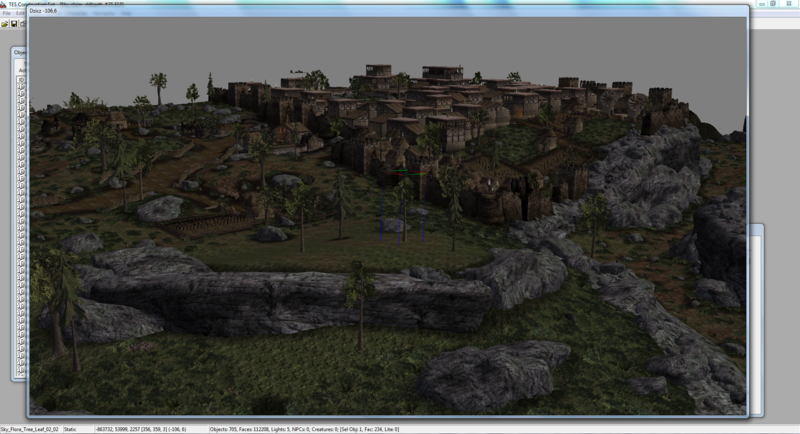 What do want to have in the place of removed Reman ruins on the Karthwasten mesa? Just some generic wilderness? A little grove (less savage than those up in the highlands obviously) might work here then, given the proximity of the forest. While preparing 26, I realised that we cannot split karthwasten into two files without an unproportional amount of effort. There are many interior cells and linked doors and as soon as you remove one half of the town in your working file, the door links from the interior doors will vanish. 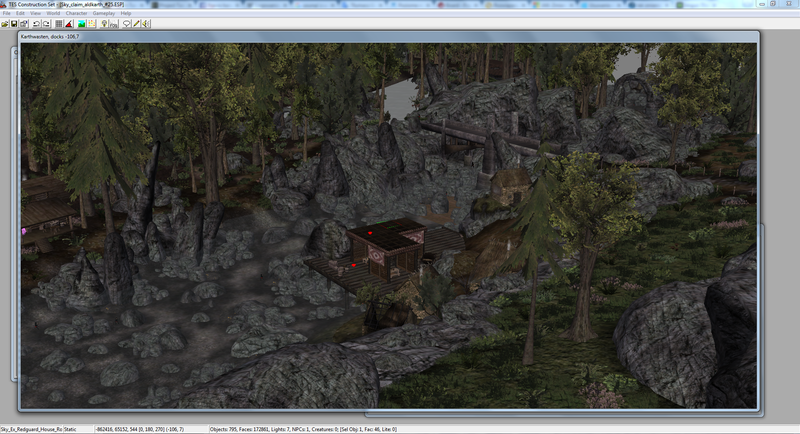 For that reason the rest of the karthwasten file is still in my working file right now. 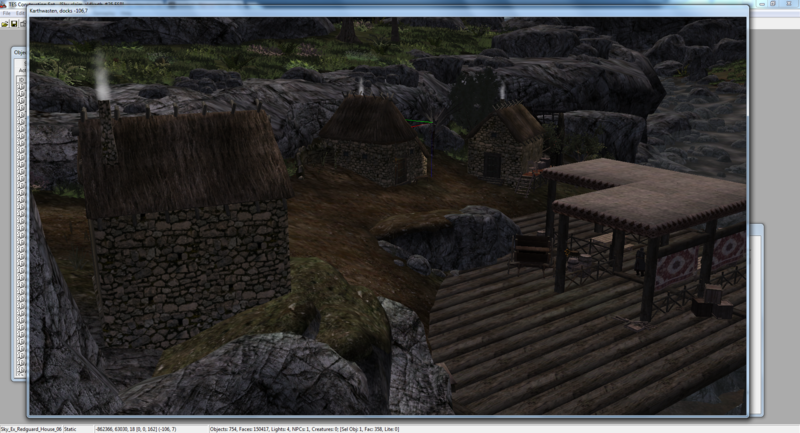 When we are both done, we might be able to do some magic with TESAME to get the two files merged. We'll have to see, if doubled interior cells get merged with each other seamlessly without doubling. I have not properly thought about that before, but I'd be surprised if it wasn't possible. I'm not sure how it is with dialogue entries and pathgrids, though. They might need to get removed within TESAME from one of the two files before merging. There are some possible complications, but I'm sure we'll figure out something. Regarding that bridge behind karthwasten, I think it would be the safest to add it in an additional step after the two claims have been merged later. You might have to rebuild it within the up-to-date karthwasten to avoid disappearance of door links. For that row of cells along the river, it might be better to wait on yetis updated vorndgad file, unless you are sure there won't be significant losses. Let's better discuss the imperial ruin in the planning thread. Too many topics at once here. Karthwasten shouldn't be split into two files. Worsas should work on his part of the file first and then pass the file over to Berry to work on for this claim. Yeti wrote: Karthwasten shouldn't be split into two files. Worsas should work on his part of the file first and then pass the file over to Berry to work on for this claim. That's probably the safest way for doing this stuff. As long as we are within npced areas, exterior work is a bit of a headache. I hope we'll get this all behind ourselves in not too distant future. finished Karthwasten docks. Some additional work would still be needed here in future phase, as I decided to leave #19 cells alone for now. 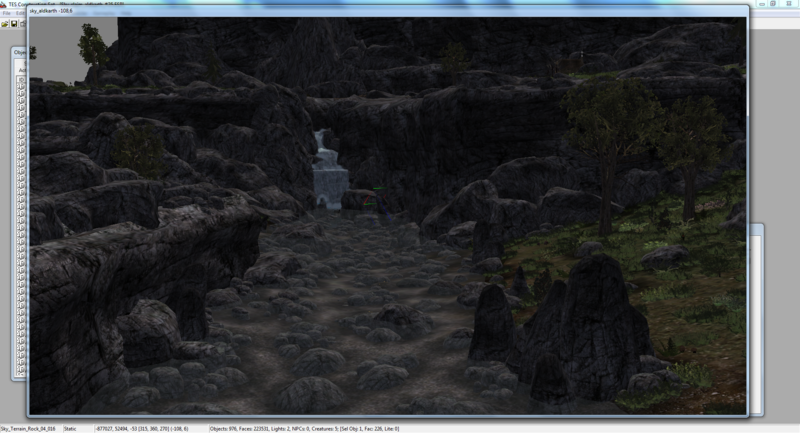 joined Scamp's grotto's latest file with this file and the worldspace. Also managed to make it to the crypt without cheating this time. outlined the shape of Karthwasten-Hammerfell road. And just realised it's claim #28 already, oops. I will leave it as it is then and focus on remaining area. I don't have anything in mind for this road and there are lots to get done within #25 anyway. Looking mighty fine, berry! That little dock is a great addition. 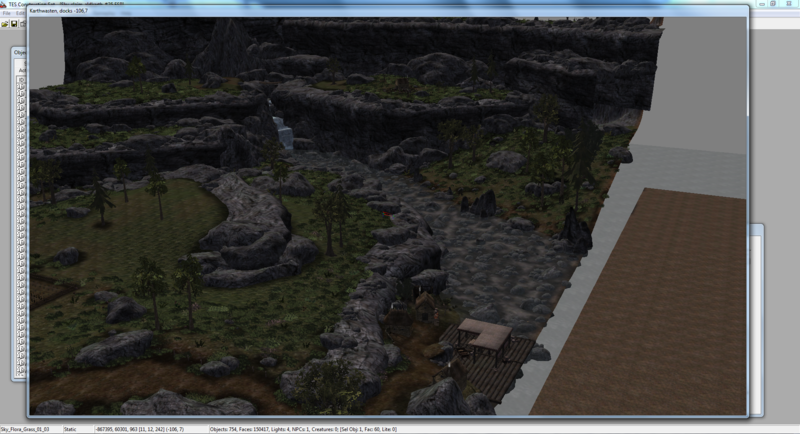 Now the player can arrive both by boat and carriage. 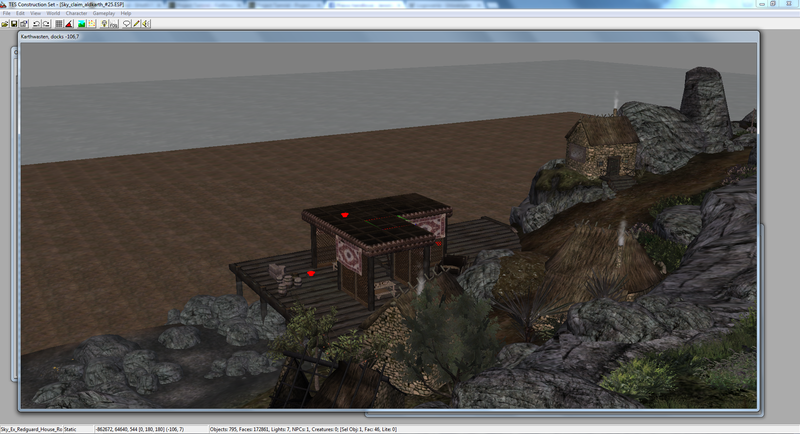 Actually, now that I look a bit closer, I propose that you do not use that tileable roofset with plaster for the docks. It doesn't look like anything that people would build in that fashion. 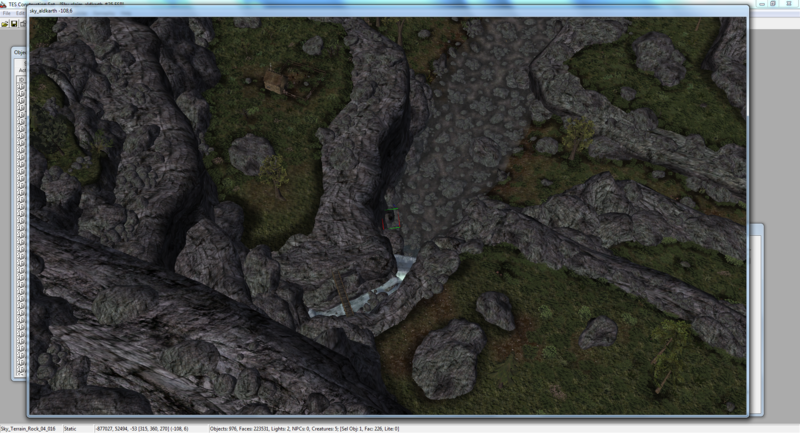 Edit: Why not use the cobbled road texture for the main road leading to Karthwasten? worsas wrote: Actually, now that I look a bit closer, I propose that you do not use that tileable roofset with plaster for the docks. It doesn't look like anything that people would build in that fashion. I will see about replacing it with something more fitting, perhaps a trellis-like wooden construction with vanilla ivy around? I think some kind of shelter or a sarai for dockers would be a nice touch here, it should be noted though this dock part of the port should largely be considered a placeholder. We should rethink how we want it to look like and what purpose it could serve in future phases. We need at least one quay for bigger ships in bordering cell of #19.
worsas wrote: Edit: Why not use the cobbled road texture for the main road leading to Karthwasten? It could be done, I didn't bother with it yet as there are many textures around and with these departing dirt paths it will be a pain in a neck to make it all look good. I'll get to it eventualy. Here's the file, too. I had literaly zero time to move it any further in these past two days, and I still intend to get this finished in few days, but with the ongoing planning on interiors it's better to share it already, I guess. Perhaps delete that mountain peak, still. It looks bad to me to have a rock object with the gashs in the texture going a completely different direction than everywhere else in the surroundings. 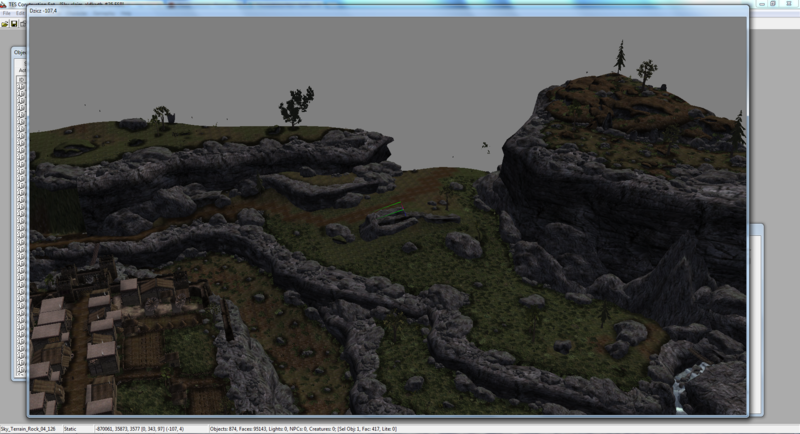 In my claim I'm already hard at the edge where it starts to look weird with the rock clumps around the cliffs (mostly around the narrow dirt road rising up the cliff edge). That's something we need to avoid, because it makes things look tinkered and unnatural. Edit: By the way: Don't worry too much about the general pressure I'm putting on everyone lately. If you cannot stick to the strict timeframe because of your studies, then that is preferable over having your studies suffer from modding. I have missed some floating grass in claim #26. Wanna fix it for me? Don't worry about the pressure, it's great we are trying to rush things up a little. That being said, I'll try not to get suspended for you guys. Thanks for the concern. 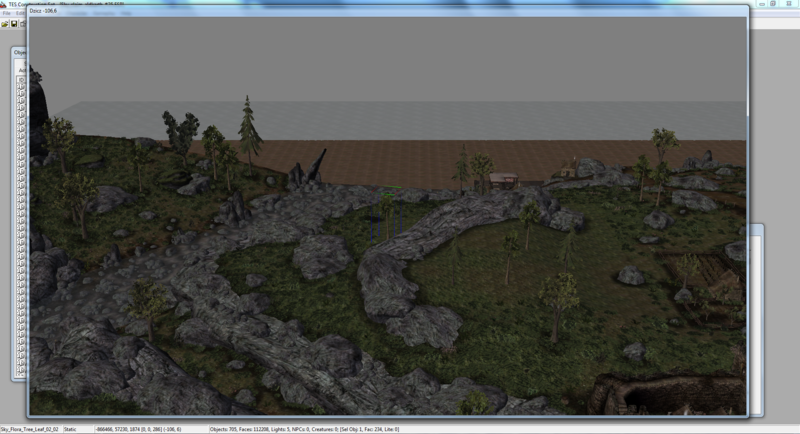 Second picture shows the area loaded together with Skyrim_main file for better overview (though I still have to clean a dirty ref from -105, 8 in my claim file, removing the landscape in this Skyrim_main cell; at any rate don't worry, I've got this under control). I think I will leave this area as it is now.